The Volvo 200 series lasted for a multi-decade production span starting way back in the hazy 70s and only ending when it was popular to "talk to the hand" (1993). Less boxy cars needed complete redesigns to meet periodic new safety standards, but the 240/260 was build decades ahead of the competition in terms of safety - resulting in an iconic boxy Volvo shape that defined the marque for a few generations. The biggest thing missing from the boxy is power and that can be easily solved if you've got the time...but why not pickup someone elses swapped box and save yourself the time and money. 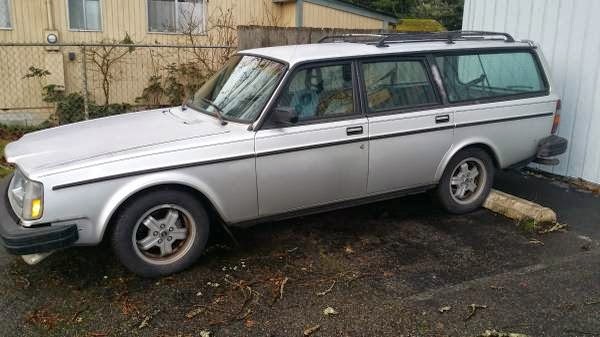 Find this 1985 Volvo 245 Wagon with V8 swap here on craigslist offered for $3,000 in Tacoma, WA. This isn't a perfect museum piece Volvo, but the asking price is favorable and most of the hard work has already been done. Anyone looking to shove a Ford V8 into the front of a Volvo 240 will need to source a kit from Converse Engineering (or Jagsthatrun) and they aren't cheap. 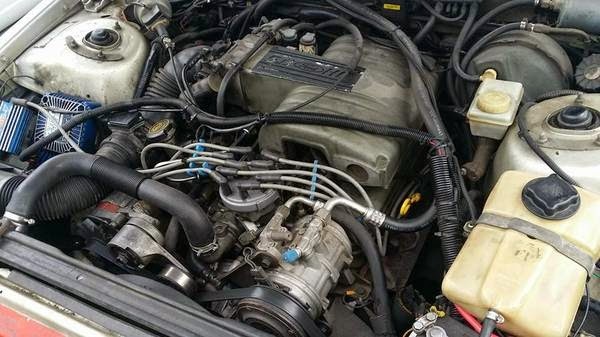 Even if you get a free Volvo and free 5.0 V8, the total cost of the conversion can easily exceed the asking price on today's feature. Ford's 5.0 liter (302 cubic inch) V8 is rating somewhere in the low 200 horsepower range from the factory (depending on donor vehicle), but aftermarket parts are available that will easily boost the power into the 300 hp range. This one could probably use some high compression internals...but that would be after you swap in a T-5 manual to replace the AOD slushbox. It appears that the front grille is missing which gives should give it a wonderful beater look. I'd rather just do my own from scratch and start with the T5, but these 245s are getting harder to come by. This one could be quite livable, it looks decently done. Doesn't a T5 pretty much just bolt right up to the 302? One of these days I will break down and just buy one of these v8lvos, the missus' approval be damned. Can you guys please find one that won't cost me $800 to ship to Palm Beach? Please? You know I'm gonna come up with a comment that will rile up a large margin of the enthusiasts here on DT. They may or may not comment on it - but you know they're fighting mad about the statement I'm about to make. These old 200 Series Volvos are awful. The interiors are some of the ugliest, least user friendly places to spend your time this side of a Yugo that I can imagine. The appearance, textures and feel of the plastics is hideous. The handling was horrendous and the general driving experience always made me want to park the thing and run away. Granted, the exterior design has a certain charm that somewhat resembles a child's toy and they're relatively easy to work on (that does not make it special), but who wants to live with any of that when you could have something older and cooler (140 Series) or at least a tad more modern (700 Series), with the benefits that go with that? Many moons ago, I used to work for a leasing company that leased several of these. They were in the shop quite often. I'm not knocking Volvo in general, just the 200 Series. I most definitely roll, as I am a proud owner of a spectacular V70 T5. But the 200s are/were pretty horrible cars. This particular example isn't even particularly good looking. Better to convert a different car. So I actually was in 75% agreement with you until you stated that the 700 series was a "benefit". I had a 1986 745 Turbo manual that SHOULD have been everyone's dream car. Bought it in the mid 90's from the original owner, in mint condition with low miles and every receipt ever. I thought I had hit the jackpot. Soon thereafter, the biodegradable wiring harness went, wreaking havoc with every system in the car, the water pump seized, causing the cylinder head to warp before I could even pull to the side of the highway, and basically everything that could go wrong on the car, did. All of this occurred on a broke college student's budget----I bought the damn car for $5k and couldn't have been happier to get $750 18 months later from my roommate. So while I still like the 7 series, it's in theory only, and certainly not reality---I'd take a 240, any 240, all day long over any 7 series. I disagree with the least user friendly comment. The 240s I had back in the day had a unique and often overlooked feature rarely found in other cars, and that was the ability to send the heat to the wind shield and the dash vents. In northern climes, one has to send the heat to the wind shield all the time, so in most lesser cars it means you can never have the heat come out of the dash vent. Assuming you're wearing the proper socks, it is a nice feature for warming yourself up. The only other car that I've seen also capable of this feat was the BMW e30. As for the handling, the 240 series had pretty good weight balance, which made it go ok for a rear drive in the snow with just a hint of over steer, as is expected in a rear drive car. I've driven recent front drive cars that have done much worse in the snow. FTB - Wiring harness for 1983 to 1987 (and possibly early 1988) Volvo cars tend to crack and deteriorate prematurely, more so with the turbo because of the added heat. Apparently, the plastic coating used in these harnesses were made to be environmentally friendly, i.e. biodegradable. This was a commendable try that unfortunately didn't work to the car owner's advantage or to the environment's advantage since replacement harnesses had to be manufactured and eventually will have to be disposed! K2 - no attacking our sacred cows for steak. What can be said of the 240 is that it was generally much better (over)engineered than most of the other offerings on the market in the late 70s and 80s.